1. Trace the CD onto the darker green felt and cut out the circle. Set aside. 2. With green acrylic paint, paint the front of the CD completely and let the paint dry. 3. Cut a stop sign shape out of cardboard (this is an 8 sided shape – see the photo for details). Use this cardboard template to trace as many stop sign shapes of light green felt that you need to spell out your name, plus one more for the center of the CD. 4. Cut four green fun foam shapes for the legs – these are like large popsicle stick shapes, or rectangles with curved ends. Cut a similar, but longer shape for the head. You’ll also need to cut a triangle shape for the tall. 5. Glue the felt head, legs and tail to the unpainted back of the CD. Cover all these parts by gluing on the green circle that you cut out in Step 1 of this project. 6. Glue the goggle eyes on the top of the head. 7. Glue on enough stop sign shapes to spell your name, plus one stop sign shape in the center. 8. Spell out your name in fabric paint, placing one letter in each of the stop sign shapes, except the one in the center. 9. You can leave the center stop sign shape plain, or add a little design like the one in the photo. 10. 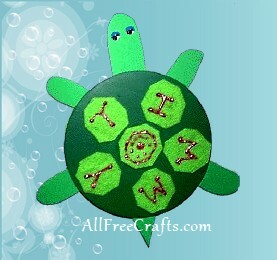 After all the paint and glue is dry, glue a magnet to the back of Timmy the CD Turtle. 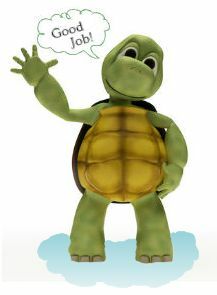 Stick him on the fridge to make you smile or to hold a little note in place!